Does Poppies make London's best fish & chips? One of the Londonist crew thinks so, and he's from Grimsby, so knows whereof he speaks. Happily for him (and indeed anyone fond of a fried spud) they're opening a new restaurant in Camden on Good Friday. Poppies first opened its doors in Spitalfields in 2011, but the owner, ‘Pops’ Newland, is well marinated in the ways of the fryer, having been serving east-enders since 1945. The new Camden restaurant, in Hawley Crescent, is a two-storey affair, and like its Spitalfields sister will be chock full of retro 1940s touches including an old jukebox, cinema seating and a piano upstairs which will be available for anyone to bust out their rendition of Knees Up Mother Brown. Not that you'll need to on the opening weekend at Camden, where a bevy of musicians will be on hand to entertain punters. 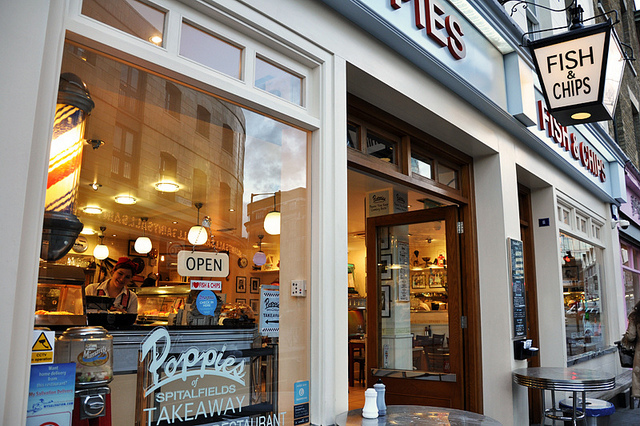 Poppies is at 30 Hawley Crescent, London NW1 8NF. Follow them on Twitter @popsfishnchips.